Discover our large selection of economy velvet earring & pendant displays and transform your store's look! Showcase your collection in style with our elegant pieces made of black & white economy faux velvet. 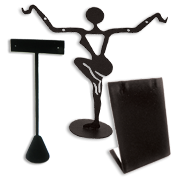 Get the best wholesale deals for pendant display trays & cases, earring trees & stud displays, or racks & rotating display stands.